I wish you all a happy New Year. The New Year we are now celebrating is according to Western calculation. This mainly affects our physical body and mind, because those in the Western world are very concerned about their physical health and mind – not more than that. Very few persons in the Western world know about the soul. They don’t even know where they will go after death. They work at jobs, but they don’t know of their goal after retirement, and they become crazy. We have to celebrate the New Year in such a way that our devotion will increase day by day. We have to know that we are not this gross or subtle body – our mind, ego, and intelligence. We are beyond all these things; we are spirit souls, part and parcel of the Supreme Lord. We have to leave what happened last year, and start anew this year. Our devotion must increase. The question may arise: “If my devotion must increase, how will I maintain my life?” For maintaining your life, you will continue what you are doing. Whether you want to or not, you must perform some karma. No one can stay alive without performing some activity. Whether you want to or not, you have to breathe. Whether you are breathing, or holding your breath, this is also karma. If you are standing, sitting, walking, or talking, all these are in the category of karma. So, to maintain our lives, we are forced to engage in some karma. But this will not give you eternal happiness, or peace and tranquility of mind. For happiness, you must engage in some devotional service, and to cultivate devotion successfully, you must first of all surrender at the lotus feet of a bona fide guru. In good association, under the guidance of Gurudeva, you can progress in devotional life. If you do this, your New Year’s celebration will be successful. In this world there are eight million four-hundred thousand species of life, and among them four-hundred-thousand are human beings. Most of the human population does not know about God. They think they know God, but who is God? What are His qualities? What is His form? They do not know at all. They only want to say “God;” that is enough for them. They don’t know more than this. In America the government writes on its dollar bill “In God we trust,” but they do not have any conception of God. So, who is God? G is for generator, He who can create this world. O is for operator, He who can nourish and protect us. And D is for destroyer. He who is the owner, creator, and destroyer is Bhagavan, or God. It is mentioned in the Vedic scripture (Srimad-Bhagavatam, 1.3.28), “Ete camsa-kalah pumsah, krsnas tu bhagavan svayam.” Krsna is the Supreme Personality of Godhead; so, we must serve Him, taking a vow from this very day, the New Year’s Day. Whatever happened happened . We have to forget all these material things and start afresh our Krsna consciousness. Then our celebration of New Year’s Day will be successful. The human body, which can award all benefit in life, is automatically obtained by the laws of nature, although it is a very rare achievement. This human body can be compared to a perfectly constructed boat having the spiritual master as the captain and the instructions of the Personality of Godhead as favorable winds impelling it on its course. Considering all these advantages, a human being who does not utilize his human life to cross the ocean of material existence must be considered the killer of his own soul. Nr-deha means the human body. We have received a human body, which is very rare, and now it is easy for us to do bhajana. However, we can see that other living entities do not create weapons of mass destruction, so many arrangements to maintain their lifestyle. If anything happens they will quarrel with each other by their claws and teeth, but at the next moment they forget their quarrelling. But we humans take revenge, and we become more ferocious than the tigers, bears, lions, and other wild animals. Nowhere in the world do we see problems in other living entities. Only humans have problems. How can we become calm and quiet and peaceful with each other? It is possible only if we do bhajana. So, nr-deham adyam su-labham su-durlabham, plavam su-kalpam guru-karnadharam. This human body is like a boat going from one place to another, in one direction or another. A captain is needed for the boat. Who is that captain? The bona fide guru is the captain of this boat – this human body. We are situated by the ocean in Hawaii. We see every day there are some boats floating on the Pacific Ocean. These boats have sails, and when the sails catch the wind, the boats move very fast. In the same way, sadhu-sanga is the favorable wind. 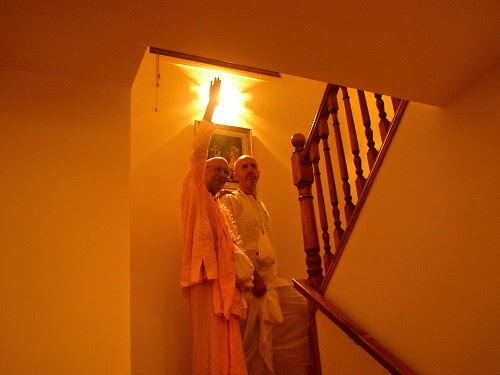 By sadhu-sanga we can advance very quickly in Krsna consciousness. Then our lives will be maintained very easily, and we can be calm and quiet and in harmony with each other. Then our celebration here will be successful. Generally, people understand the meaning of happiness in terms of the body and mind, health and money, and good sons and daughters. They consider that if they have these, they will be happy. But everyone becomes unhappy in spite of having these things. For a long time – since the creation of this world – we have been coming and going, taking birth and dying, but still we are not happy. We have forgotten Krsna. We are part and parcel of Krsna, and we have forgotten Him. That is why His illusory maya took us and threw us into this world, and covered our constitutional body, form, and qualities with two bodies – the physical body and the subtle body. We are trying so hard, here and there, to be happy, but really everyone is unhappy. Only a truly qualified guru can teach us by what process Krsna’s service can be achieved. Then, by practice and maturity of bhakti-sadhana, we will become happy. My blessing is that I am praying to Krsna that He will sprinkle His mercy upon you all, so that you will be happy in every way – by body, mind, and soul. Haladhara dasa: What is the meaning of the name Radha, or Radharani? Srila Gurudeva: Radha means ‘always serving Sri Krsna.’ Radha means ‘to please Krsna.’ Also, She is pleased by Krsna. Radha means ‘She runs towards Krsna to serve Him.’ Radhika means ‘Krsna searches for Her and pleases Her.’ Also Krsna means ‘very beautiful, with having so many good qualities.’ Rupa-madhuri: He is very, very beautiful. Venu-madhuri: His flute playing is very, very sweet. Guna-madhuri: He is full of very sweet qualities. Lila-madhuri: His pastimes are so sweet. By these qualities Krsna attracts all beings in the world and delivers them. All living beings, namely birds, animals, and all other creatures, are attracted to Him, and therefore He is Krsna. Krsna is the ocean of rasa, the ocean of transcendental relationships, and Radha is the main power of Krsna and the embodiment of maha-bhava. By sweet service to Krsna, She attracts Krsna and controls Him. Though Radha and Krsna are not two bodies, only one, Krsna is the one Supreme Person and Radha is the sakti, or power, within Him. For lila-vilasa, or sweet pastimes, They have become two bodies, but They are one soul.